Quadrax VII follows on the footsteps of the previous games of the series, with long years of experience being clearly visible in this free PC game. One of the distinctive qualities on offer is the longevity at display, longer than a lot of commercial games – eight levels in eight different scenarios to make you use your brain to the max. The gameplay in this puzzle game is simple to grasp but not so easy to master. 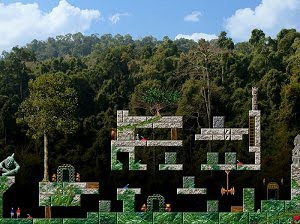 Two or more adventurers are exploring the flying island Laputa, and your objective is to guide them to the exit. Just think logically, overcome the obstacles, interact with the different objects such as levers, push some blocks and reach the exit. A great game for logical thinking addicts.